Inspired by his presentation on our recent jewelry trip, I realized that featuring Dale Edaakie was long overdue. Dale Edaakie is the reigning master of Zuni inlay jewelry. 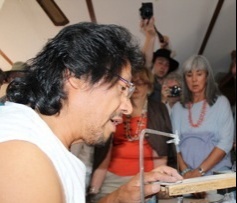 He is the third generation in a prominent family of inlay jewelry artists at Zuni Pueblo. 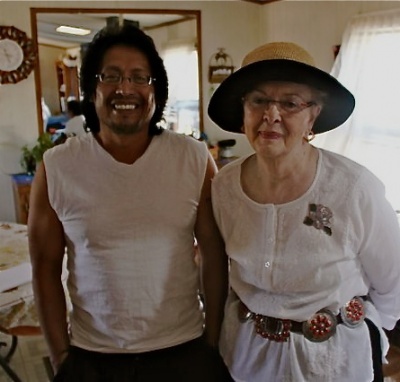 In fact, Dale's parents are Dennis & Nancy Edaakie, the famous Zuni inlay jewelers. While Dale Edaakie’s parents are best known for their amazing bird inlay, Dale has taken his work one step further by adding wildlife to his repertoire. He was inspired to do so after seeing an impressive elk standing by the side of the road. Today, Dale considers himself a “wildlife artist”. He is widely considered one of the most creative inlay jewelers to have graced the American Southwest because of his wide variety of animal, bird and other naturalistic creations. Initially, Dale wanted to be a still life painter, but now as a jeweler, he produces remarkable works that are so exact they are almost more akin to naturalistic paintings than they are to pieces of jewelry. Technically, Dale’s work is unsurpassed. The amount of life-like detail that Dale is able to achieve is nothing short of astounding. He is able to capture little subtleties such as facial expressions, movement, and even color shading with great skill. Notice the movement and subtle colors on this pheasant pin. Keep in mind that Dale achieves this with shell and stone being inlaid onto metal rather than paint on canvas. During our recent visit with Dale, he took our group through his creative process using his rose pins in various stages of completion as a guide. From his initial sketch on paper to transferring his sketch to a sheet of silver or gold and then cutting it out, Dale begins his inlay jewelry process. He then traces on top of shell and stone, which he hand-cuts and files into little pieces that he will inlay into the metal frame. Finally, Dale etches the small details onto the piece. A nice buffing is the finishing touch. Dale is quick to explain that if a piece does not come out looking perfect, he will scrap it and start over again. I’ve been so impressed with Dale’s ability to create realistic interpretations using jewelry that I’ve sometimes shown him photos or drawings that I thought he might be able to translate into works of jewelry. One time, I showed Dale Edaakie the North American bird watercolors beautifully painted by John James Audubon. From one wildlife artist to another, Dale was able to skillfully adapt the Audubon paintings into a series of dazzlingly intricate bird pins, a very special feat indeed. I hope you enjoy Dale’s work and remember that it is not just a piece of jewelry to be worn, but also an object of art to be displayed and admired.